I’m deeply grateful to our Session for supporting the faith leaders press conference that was held at Guilford Park Thursday, February 8 and to the many congregation members who came. The conference was in support of a clean Dream Act or similar legislation to protect the young people who were brought as children to this country without documentation. Our elected officials were called on by name to do the right thing, the moral thing. There were no personal attacks and no partisanship. The event was political in the sense that elected leaders were called on because only our elected leaders can resolve this moral issue that touches the lives of hundreds of thousands of young people raised and educated among us. If you were there or saw the conference on the news, I hope you agree that this was a deeply faithful event. The word of God was proclaimed in our sanctuary, proclaimed emphatically, by these faith leaders. I was moved by what the Spirit did through them. They were given no scripts, no assigned messages other than the general message of support for a Dream Act and support for keeping families together. And yet from the opening prayer by Jeff Paschal through the resounding closing call “Let My People Stay” by Rabbi Andy Koren, each affirmed with passion and clarity our scriptural imperative to love our neighbors and welcome the stranger. Several stories of particular DACA recipients were shared. As David Fraccaro, Executive Director of FaithAction, often says, if we can take off our political hats and put on our faith hats, we can hear with greater clarity and come to consensus on the moral message: When people are suffering in fear, families are facing brutal abrupt estrangement, and young people are longing to make their place in the only world they have ever known, our faith compels us to speak out for them. That is what occurred on Thursday in our sanctuary. We left on a hopeful, upbeat note with the impromptu simple words of “This Little Light of Mine” sung by the gathered crowd of over 100 people, accompanied by Rabbi Fred Guttman at the piano. May God bless these young Dreamers for their courage and these religious leaders for their faithful witness. The title above is a quote from Jesus, from the King James Version of the Bible. The full quote reads “Suffer the little children to come unto me.” Jesus is asking his followers to let the children engage with him rather than shielding him from them. Later translations use the word “Let” instead of “Suffer,” but the double meaning in the word “suffer” catches our attention as we think about children living in poverty. They suffer. And too often we Christians shield ourselves from them and their suffering. Our study of childhood poverty through the book Our Kids has taught us that poor children are increasingly out of sight and therefore out of mind for those of us in the middle and upper classes in America. We live in separate neighborhoods, attend different churches and schools, and have increasingly fewer community interactions. Studies and our own experience teach us that when we don’t know poor people, we are more likely to ostracize, stigmatize and create myths about them that further shield us from their plight. GPPC member Trent Walton, a middle school principal, opened our minds to the challenges poor children face in addition to lack of material resources, challenges that often cause us to stigmatize rather than empathize with them:“Children are born with six hardwired emotional responses: sadness, joy, disgust, anger, surprise, and fear. All other emotional responses must be taught, including humility, forgiveness, empathy, optimism, compassion, sympathy, patience, shame, cooperation, and gratitude. When compared to children from well-off families, children living in poverty are more likely to not have access to an adult with the time and/or ability to teach them these critical emotional responses.” From Teaching with Poverty in Mind, by Eric Jensen. We might think about the many ways we “other” the poor, as discussed in this article we shared in the Our Kids study. We who serve on the Justice and Peacemaking and Enrichment committees are grateful that so many of you chose to engage with us, to read and study and listen and learn and discuss. Whether or not you’ve had a chance to join us so far, we hope you will come to hear Gene Nichol this weekend, and hear him with an open mind and heart. Let us seek to be transformed by God’s word into people who suffer — and suffer with — the little children. My friend David Fraccaro from FaithAction International House likes to ask when he’s talking to Christian folk about immigration, “Take off your political hat and put on your faith hat.” When we do that, we find we have more in common than we might think. That’s what we’re asking our congregation and community to do on October 21 and 22 when Gene Nichol speaks to us about childhood poverty. Let’s take David’s approach — put aside our political hats and put on our faith hats. How can our faith inform our thinking about children in poverty? “Learn to do good; seek justice, rescue the oppressed, defend the orphan, plead for the widow.” (Isaiah 1:17). This is not an isolated verse, but a central theme of the scriptures of the Old and New Testaments. Can we allow the Bible to speak to us about poverty? Can we allow Jesus Christ’s words and actions toward the poor to move our hearts and inform our thinking? Can we think about poor children as children for whom we share responsibility? Can we hear Gene Nichol’s words through the filter of God’s justice rather than the filter of our partisan righteousness? Will you come? Which hat will you bring? Why Should We Learn More About Childhood Poverty? Have you heard that our church is studying childhood poverty this fall? Many of us are blessed with abundance or at least with enough to enjoy what we consider a decent, middle-class lifestyle, and share a little extra with our poor neighbors through Greensboro Urban Ministry, mission trips and other charities. So why is a nice church like ours talking so much about childhood poverty? Our Session established goals for the work of the church this year. One of those was to increase our efforts in advocacy and education on issues of justice and peacemaking. Another was to consider how Guilford Park might become a 21st Century church, a “thought leader” in our community. The Childhood Poverty study addresses both goals. But the underlying reason for our study is that as we worked on justice and peacemaking issues, we realized how much poverty impacts those who are marginalized. Some folks might consider that more of a political issue, not a faith concern for the church. But it turns out that the Bible, and in particular the prophets and Jesus, have a lot to say about God’s care for the poor and marginalized and God’s passion to seek justice for them. And it’s pretty clear that God expects us to have that passion, too. We start from a place of confessing: That we don’t know as much as we think. That we make a lot of assumptions. That we believe and recite a lot of myths. That we would rather not think about poor children too much. That we’re not sure they’re really poor. If you haven’t had a chance to participate in any of the classes, there are still two more each of the Monday evening book study and the 10:00 a.m. Sunday School class. We would welcome you! But even if you can’t make any of those, we really, REALLY hope you will join us for the Ruth Lamb Enrichment Series weekend, October 21 and 22.
Who was Ruth Lamb? A long-time member and supporter of GPPC. 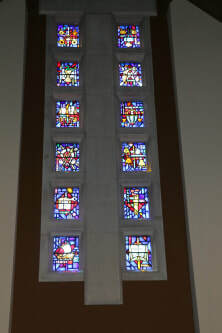 She and her husband Jack established a fund to support enriching events for the church long after they were gone. And the fund has done just that: We’ve heard great speakers, participated in marriage enrichment and music programs, and expanded our understanding of youth ministry and liturgical arts, to name a few. This year for only the second time in the fund’s 20+ year history, we have a speaker on a social justice issue, childhood poverty. He is Gene Nichol, professor and former Dean of the law school at UNC-Chapel Hill. Gene is also director of the N.C. Poverty Research Fund. Gene has studied poverty in North Carolina over many years and has a challenging message: It will take both private charity and public policy changes to lift our children out of poverty. So we hope you’ll come hear Gene, come and join our church family, come and welcome our community for this excellent speaker. All the details are available at the church website, on the church Facebook page, and in the brochures and posters at the church. Be sure to make a reservation and prepay for the dinner Saturday the 21st at 6:00 p.m. Everything else is free and requires no reservation. Why should we learn more about childhood poverty? Because children in poverty are God’s children, and they are our children, too. Worshiping from the pews this summer, we were treated to a great sermon series titled “Music Lessons.” In additionspecial music summer 2017 to the spoken word describing the interplay of melody, harmony, form and rhythm in our lives, a wide range of special music enhanced the spirituality of the services. While the congregation found a steady rhythm in worship, the rest of church life took its own sabbath rest time with a break from committees, Sunday school, choir and other group meetings. But that’s just the surface view. Action was definitely happening–it was simply elsewhere or at other times. The middle school youth went on a spiritual retreat to Massanetta Springs and are now preparing for a mission trip to Washington, DC. The high school youth have had their mission and spiritual retreats as well. Not to be left out, the younger crowd from the church and community filled our halls with record numbers for Vacation Bible School. At the same time, a hearty band of members launched an international mission to Nicaragua. Phew! That’s a lot of activity. You see, June and July were just low points for committee meetings. That is what struck me when committee meetings drew me to the church two nights in a row. These two meetings are in preparation for upcoming events, much like the various mission and retreat activities of the summer. The rhythm of planning the events and producing the events are now the rhythm of the late summer and fall. In case you don’t know, as I did not, what this 15-year old conference is all about, here’s a brief summary from the website. This particular 2017 gathering celebrated the 50th anniversary of the “Beyond Vietnam – A Time to Break Silence” speech given by Dr. Martin Luther King Jr. at Riverside Church in New York, one year before his assassination. You can listen to it here. Some of what we heard made us uncomfortable, but we were there partly to be made uncomfortable. Some of what we heard affirmed our fledgling Justice and Peacemaking ministry at GPPC that has been supported by so many of you. Much of what we heard challenged us to dig deeper into the meaning of justice in our nation and our world, deeper into empathy with those who suffer from injustice, discrimination and marginalization, and deeper into the power and challenge of being an advocate. And we connected with people from across the USA, from many different faith communities, who are facing the same challenges. It was powerful to stand on the lawn of the Pentagon with a couple hundred others singing and praying for peace, especially after having heard stories from around the world of how our nation often takes actions that seem to promote war and not peace. It was equally powerful for me to witness Peter pushing an elderly man in a wheelchair back to the hotel, one of God’s mighty warriors for peace even in his age and infirmity. He was grateful for the help and clearly thrilled to be there! 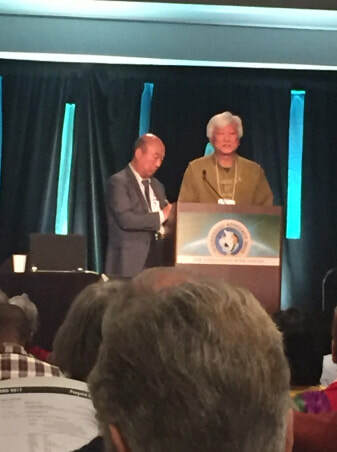 Earlier in the day, one very poignant story came from a North Korean guest speaker, begging that we as Christians advocate that our government help promote a peace process and not escalate war. I thought of that man and the everyday citizens on whose behalf he spoke, and prayed that our nation will exercise wisdom and restraint in the current climate. His face will stay with me as our leaders debate our course. And on our last day, Peter and I were happy to head to the Senate office buildings to sit down with the rest of the NC “delegation” and talk with staffers of Senators Burr and Tillis about the budget. We asked that we not increase military spending at the expense of spending on people, health care, infrastructure, education and the environment. We asked that the proven programs that have fed people here and around the world not be cut, but expanded. We asked that black and brown people – African Americans who have been imprisoned in such devastating number, Muslims and others who seek refuge from terror and war, immigrants who seek a better life and have contributed to our communities – that these people be protected and respected as God’s children. 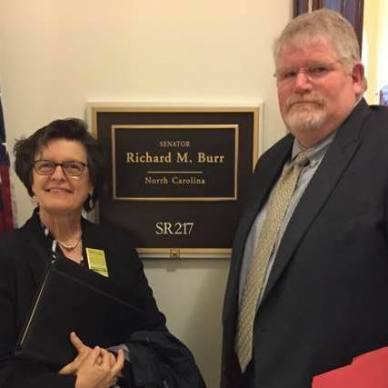 Here’s a picture of the two of us outside Senator Burr’s office: Let me say how grateful I am for our congregation that has also been challenged and stretched by this new ministry. Many of you like me grew up not understanding what on earth such “political” matters have to do with faith, and together we are coming to understand that working for justice and peace in the world is actually central to our Christian call. Let me also quote Dr. Nelson again: “There is no conflict between justice and spirituality. A church can do both.” I thank God as always for all the good ministry in which we are engaged at GPPC. And I hope more of us will get the chance to attend the Ecumenical Advocacy Days gathering, and bring back their energy, passion and ideas, as together we strive to be people who seek justice, love kindness, and walk humbly with our God. Stand Up and Step Out! That’s the title of the church’s theme for 2017. The words reflect the primary purposes of two of our session committees—Justice and Peacemaking (“Stand Up” to advocate for the poor and marginalized and for peace) and Mission (“Step Out” in service to those in need). We want to challenge more members of the congregation to become involved in our work, in addition to the good ministry you do within our congregation. This past week has been a busy one for both ministries. Last Sunday we celebrated our partnership with Bread for the World, reminding us of the need to continually pray and advocate for the hungry and malnourished. On Tuesday night the church hosted a gathering of approximately 125 people, both from GPPC and from the greater community, to hear a challenging presentation on systemic racism in our culture. From presenter Bay Love we learned that studies have confirmed the existence of race as the most important factor in significantly poorer outcomes for blacks than white across all our systems—education, health care, criminal justice, social services, and financial services. Part of the crowd at GPPC to learn about systemic racism. This conversation comes at the end of a two-month Sunday School class on race led by the JP Committee, and just prior to the study of Jim Wallis’ book on racism, titled American’s Original Sin. We hope to help bring to the congregation and community a heightened awareness of the role race plays in our culture, as well as thoughtful responses for us as a Christian congregation to the injustices caused by the sin of racism. Wednesday evening three of our members participated in the Air Horn Orchestra outside the Governor’s Mansion in Raleigh, to bring attention to the injustice that HB2 has brought to the LGBTQ community in North Carolina. Meanwhile on Wednesday morning, a team of eight hardy souls left on the annual mission trip to Washington DC, where they will work in various ministries related to poverty and homelessness. They will represent us well as they extend the love of God and the hand of fellowship to those in need, helping provide direct services through various ministries there. This extended trip caps off a busy season of the Mission Committee’s regular ministries to feed the hungry through GUM, Interactive Resource Center, A Simple Gesture and Hot Dish and Hope, as well as sponsoring the annual Blood Drive, the current Habitat for Humanity build, and the CROP Walk. Many of these ministries will continue through Advent and into the new year. And coming in July 2017, an international mission trip! The Mission Committee held an informational meeting on October 18, and looks forward to serving our international community on the trip. More information to come for members of the congregation interested in joining. Together Justice and Peacemaking and Mission represent a good part of our congregation’s effort to share the love of Christ with the world outside our church walls. They do not compete, but complement each other. As Frank Dew so beautifully illustrated in his recent sermon, when the sink is overflowing with water we need to both mop up the immediate problem of the water on the floor (Mission) and turn off the water to address the long-term source of the problem (Justice and Peacemaking). Stay tuned as we challenge you in 2017 to Stand Up and Step Out! There’s a real term called “race fatigue.” It refers to the stress African American students feel as they navigate predominantly white institutions of higher learning. But many white people suffer from a different kind of “race fatigue” – a weariness with hearing about race and racism. We wonder why we are still talking about racial inequity fifty years after the Civil Rights Movement. Weren’t these issues resolved with the passage of the Civil Rights and Voting Acts? Isn’t the African American community responsible now for its own problems? And many of us also might wonder, What does this have to do with the church? Why do we have to hear about this from the pulpit, in classes, in the newsletter, and now now here in the church blog, of all places? Aren’t these political and economic issues, rather than faith concerns? But despite these notable exceptions, I must honestly reiterate that I have been disappointed with the church. I do not say this as one of those negative critics who can always find something wrong with the church. I say this as a minister of the gospel, who loves the church; who was nurtured in its bosom; who has been sustained by its spiritual blessings and who will remain true to it as long as the cord of life shall lengthen. When I was suddenly catapulted into the leadership of the bus protest in Montgomery, Alabama, a few years ago, I felt we would be supported by the white church. I felt that the white ministers, priests and rabbis of the South would be among our strongest allies. Instead, some have been outright opponents, refusing to understand the freedom movement and misrepresenting its leaders; all too many others have been more cautious than courageous and have remained silent behind the anesthetizing security of stained glass windows. We are confronted in the news with incidents that reflect ongoing racial tensions, racial violence, and racial injustices, both around the country and here in our own community. In all of our institutional systems – education, health care, social services, criminal justice, etc. – outcomes for blacks are worse than for whites. Study after study indicates race is the determining factor for those poor outcomes. We struggle with how to respond as Christians to these realities. A Sunday School series (4 weeks, Sept. 11 – Oct. 2), led by Tim and Laura Peck and Keith Harrington, based upon video lessons developed by Salem Presbytery’s Task Force on Peace and Justice. Drop in on any class. A study of evangelical leader Jim Wallis’s book, America’s Original Sin: Race, White Privilege and the Bridge to a New America (Monday evenings, Nov. 7 – Dec. 5). This book speaks directly to us as Christians. 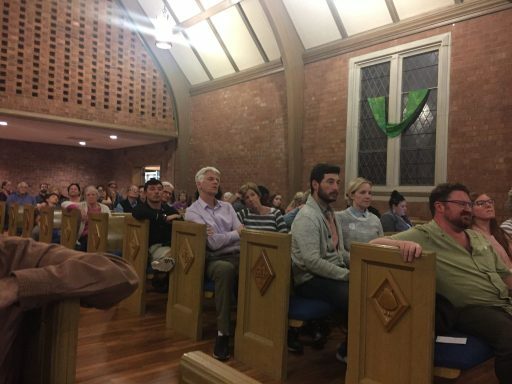 A series of discussions hosted by GPPC and other churches titled “Doing Our Work,” specifically for white people who want to better understand racism, put on by the Guilford Anti-Racism Alliance, the first Tuesday of each month beginning in October. Find the schedule on the JP bulletin board. GPPC will host the meeting on Tuesday, November 1st.